Recipes by me, photos by Rikki Snyder. Even though I have a food blog, I have to confess that I get overwhelmed when cooking a few things at once. Does that happen to you too, or am I just especially weak and easily confused? It seems like the more I have going on in the kitchen, the more likely things are to end up charred and inedible. So when developing recipes for a vegetarian Thanksgiving, I wanted a good mix of dishes that were a little more involved and dishes that required very little time, effort, or thought. These Rosemary Roasted Carrots are one of the latter. I also decided to add some simple roasted vegetable recipes to our Thanksgiving line-up because I wanted to have some lighter, healthier options in the midst of the stuffing and dessert and mashed potatoes. And that brings me to the other topic of this post: World Diabetes Day. When Carolyn from All Day I Dream About Food asked me to be involved in her World Diabetes Day event, I didn’t hesitate to say yes. But then I had a moment of doubt–do I even know how to make a recipe that’s diabetic-friendly? Carolyn assured me that I post diabetic-friendly recipes all the time and I just didn’t realize it–obviously, sugar is a no-no, and carbs should also be limited or omitted. A staggering 347 million people worldwide have diabetes; one of them is my Grandpa. While some diabetics are simply born with an inability to produce adequate insulin, Type 2 diabetes, the most prevalent form of diabetes, results from the body being unable to use insulin effectively. I think we often downplay the seriousness of diabetes because it seems like a treatable, manageable disease. We know people with diabetes–they work with us, they run marathons, they seem perfectly healthy. But treatable is not the same as curable–complications of diabetes include cardiovascular illnesses, blindness, kidney disease, and amputation. Please visit Carolyn over at All Day I Dream About Food and read her post about World Diabetes Day. She’ll be linking to other blogs that are taking part in today’s event, and she’s also giving away a KitchenAid Stand Mixer on her blog–it’s blue, the color of diabetes awareness. Today Rikki is posting my Whipped Sweet Potatoes recipe. They’re sweetened with maple syrup and topped with pecans. If you don’t like the overbearing sweetness of traditional sweet potato casserole, this recipe is perfect for you! A healthy, simple Thanksgiving side dish. If you can find them, use heirloom or rainbow carrots for this recipe. Preheat oven to 400ºF. 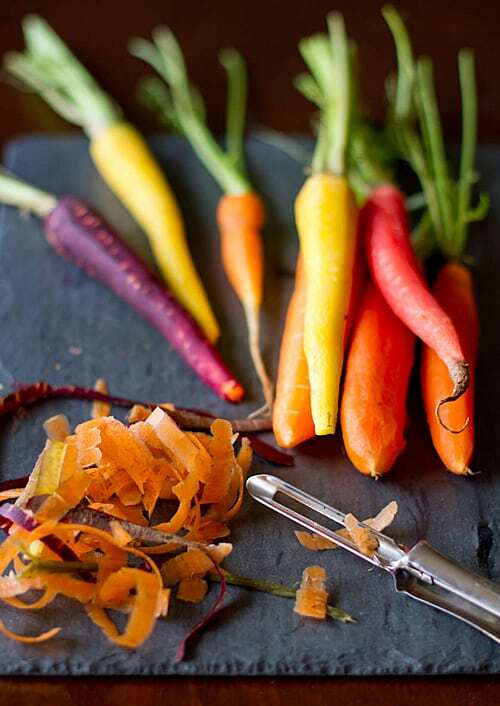 Toss the carrots with olive oil on a rimmed baking sheet. Sprinkle with rosemary, salt & pepper. Bake 20-25 minutes or until tender. If you want to leave the tops of the carrots on, loosely wrap them in foil before baking so they don’t burn in the oven. So colorful and delicious looking! Love these, Kiersten! Thanks for participating in my big WDD Initiative. Thank you for hosting it! Sometimes simple can be very satisfying. These colors look wonderful! 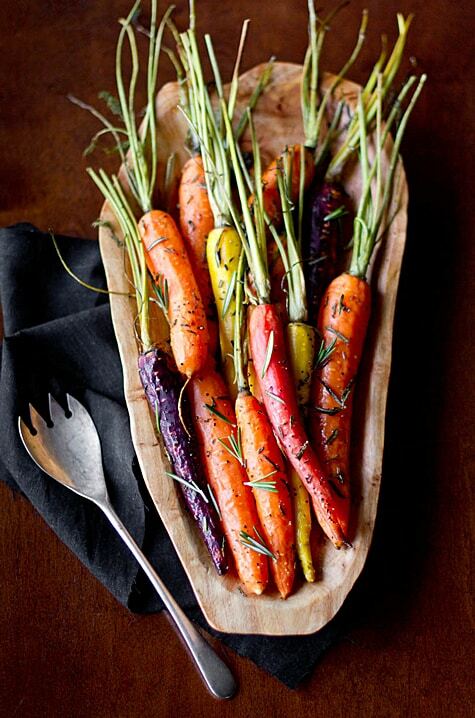 Your carrots looks beautiful and with the abundance of rosemary in our garden, I have all the ingredients on hand! Our rosemary is still going strong too! I need to make more recipes with it. New to your blog. So happy to have participated so I could find you. Really loving this recipe. Your photos are stunning. Thanks for stopping by! I’ve found a lot of great new blogs through Carolyn’s event too–I can’t wait to check yours out! I hope you liked them! 🙂 I serve roasted veggies as a side at least once a week–they are so easy! These are so lovely and I know they would be delicious because I love roasted sweet carrots! If I can find a a couple of bunches, these beauties will be gracing my Thanksgiving table. I need to try this, I love anything with rosemary on it, and I usually just cook my carrots with nutmeg and brown sugar! Ooh, nutmeg and brown sugar sounds really good! That last pic is absolutely gorgeous. These are so pretty – I don’t think I’ve ever seen a purple carrot! Type 2 diabetes runs in my family (my mom had it, apparently it’s strongly correlated to pancreatic cancer) so thanks for the shout out! thank you for this recipe! I am not usually a fan of cooked carrots but I just imagine I would absolutely LOVE these. These were a stunning addition to our Thanksgiving Dinner! I was hoping for seconds for myself, but everyone else gobbled them all up. Thanks for the recipe and I hope you enjoyed your long weekend too! Ha! Don’t you hate it when that happens? 🙂 I need to make these again too–I wish my rainbow carrots would hurry up and grow! 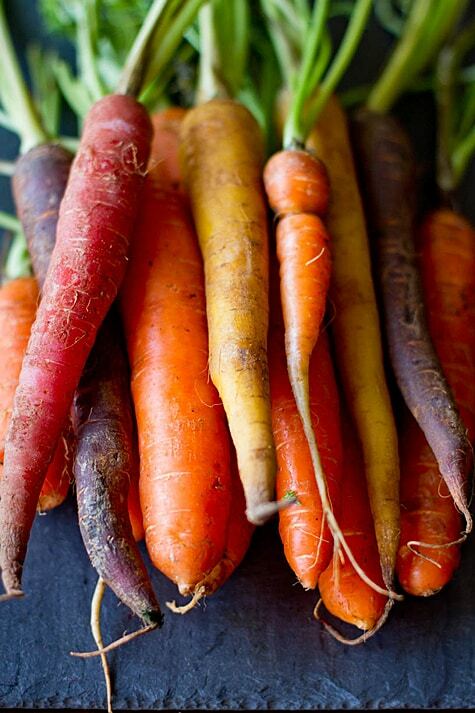 Beautiful colorful carrots! I usually use dill or thyme with these roots, so I can’t wait to try them with rosemary. And thanks for raising diabetes awareness. I love thyme with carrots too, but I’ve never tried dill! I’m going to have to do that. It’s for mixed roasted roots, but I do it with just carrots all of the time and it’s yummy! These were part of a full Thanksgiving menu feature I did with another blogger, which you can find here: http://ohmyveggies.com/a-vegetarian-thanksgiving-menu/. But really, these are the kind of side dish that goes with just about anything! I would like to subscribe to this blog. How? At the top of the page, there’s a subscription box and under every post there’s another one. Enter your email address there; once you do, you’ll get an email asking you to confirm your subscription. These look so yummy! I’m planning to make them for Thanksgiving this year (along with several of your other recipes 🙂 ) – I’m wondering how you think it would turn out to make them ahead and reheat them on the stove so I can save my oven for other dishes? Might work or bad idea? Thanks!! I think roasted veggies are just better fresh out of the oven. Which probably isn’t what you want to hear. 🙂 It’s not that they’re bad, and it’s definitely doable, but for a Thanksgiving dinner, I think they’d be better made that day. Beautiful pictures! Can’t wait to try this. Where did you get the beautiful wooden dish from?